After so many batches of custard based ice creams – there are recipes I’ve made three or four times – I had several egg whites left. I did freeze some but there were a couple of whites still in the fridge – that seemed like the perfect excuse to make meringues. I’d bookmarked this recipe ages ago – I just love Delicious. magazine’s website – and it called for only 5 ingredients, all of them in my pantry/fridge... The perfect treat for those moments when you are feeling much too lazy/tired for a trip to the grocery store. Preheat the oven to 140ºC/284ºF. In a large, grease-free bowl, using an electric mixer, whisk the egg whites to soft peaks. Gradually whisk in the caster sugar, 1 tablespoon at a time, until you have a thick, glossy meringue. Using a large metal spoon, briefly fold in the mixed dried berries to evenly distribute through the meringue. Line 2 baking trays with baking paper, fixing the paper in place with a tiny blob of meringue in each corner. Using 2 large metal spoons, take a spoonful of the meringue and scoop it from 1 spoon to the other to shape it into an oval ‘quenelle’ shape; alternatively, just dollop large, craggy spoonfuls of the meringue onto the baking sheets. Drop onto the baking paper, then repeat to make 8 large meringues, spacing them 5cm (2in) apart as they will expand as they cook. Sprinkle with the chopped pistachios. Bake the meringues in the oven for 1h15min for mallowy centers, or 1h30min for crisper meringues – swap the trays halfway to ensure even cooking. 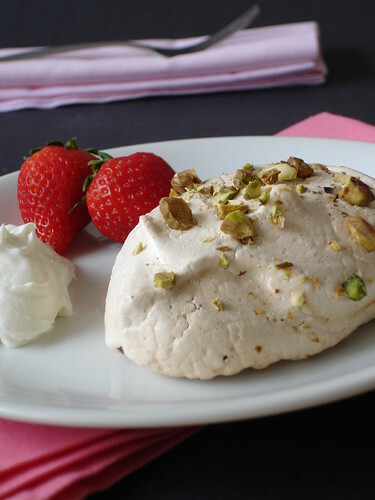 Turn off the oven and leave the meringues inside to dry out for at least 4 hours, or overnight. To serve, transfer the meringues to serving plates. Whip the cream to soft peaks and serve a dollop with each berry meringue. The cooked meringues will keep in an airtight box in a cool place for up to 4 days. 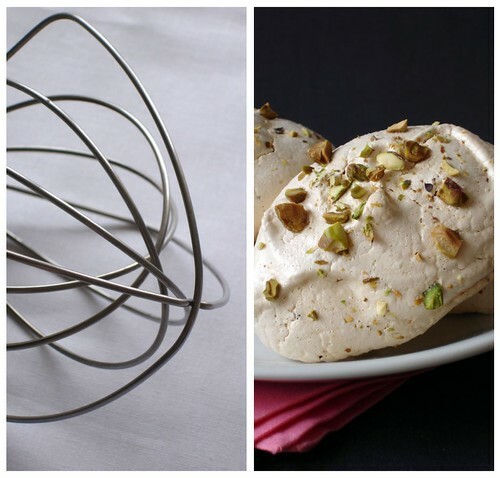 Meringues are simply magical! Slightly crunchy and airy, yet so flavorful and beautiful :) Glad these came out so well! What a great way to spruce up a meringue! Sounds delicious!! And they look beautiful, too! Agree with above posters that meringues are truly magical. Yours look great! And the berries? Yummo. Perfect, I have 4 egg whites in my freezer, just waiting to be used up! I can never think of what to do with leftover egg whites. These meringues look delicious. I have a bunch f whites in my fridge too after so many ice creams and custards. Meringue isnext. Lovely! I am a sucker for meringues...any ways, any forms! My bday cake is always meringue and ice cream layered together! Those are so pretty Patricia! Pam, hope you like it, darling! Lydia, I'm glad you like them! Aran, I'm sure your meringues will be fantastic! I have one word to say here...SAVED! Those look gorgeous Pat, just lovely!! Oh Paula, that certainly doesn't lack anything. It's perfect in every way. YUM!! It couldn't want anyhting, but everyone could want it!!! 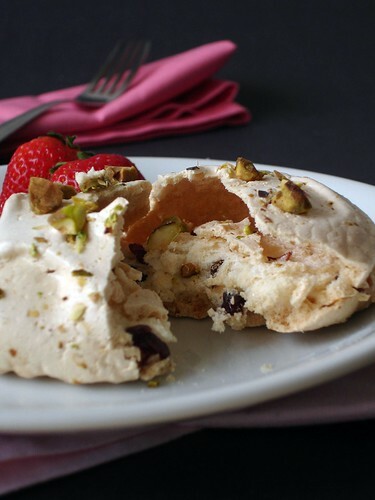 I just love meringues--and yet I've never made them myself!! It's about time to try to get past my fear and do it. I have bookmarked the Delicious website. One great looking dessert. It is very interesting for me to read the blog. Thanks for it. I like such topics and anything connected to them. I would like to read a bit more soon.